What is a "web feed", anyway? A web feed is your favourite website, delivered to you automatically the way you want it, as soon as it's available, and entirely free. More strictly, it's a chronological ordering of content such as blog posts, pictures, podcast episodes etc, created in such a way that computers can automatically process it and show you what's new. For an example, check out You Need Feeds' very own web feed! A web feed is viewed through a feed reader, which does the dirty work of checking for updates and showing you what's new. Adding sites you like to your feed reader and making your own cozy little home on the internet is at the core of the web feed experience. 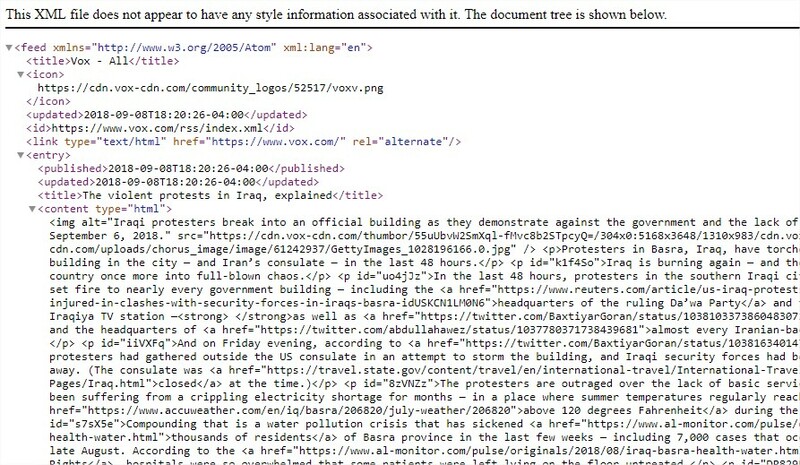 Internally, web feeds look a bit like website code. Don’t panic if you see this! Give the web address to your feed reader. It'll know what to do.